A quick look at some of the installations from this year's Fermentation Fest in and around Reedsburg. "Ghost Barn" by Sarah West and Christopher Field. During this year's Fermentation Fest, which ran from October 2 through 11, artists put up installations in the towns and fields along a 50-mile loop of Sauk County roads for a countryside in a driving tour called the Farm/Art DTour. It's tough to do justice to the variety of these works, which used everything from microbial audio to written passages in abandoned small-town storefronts. 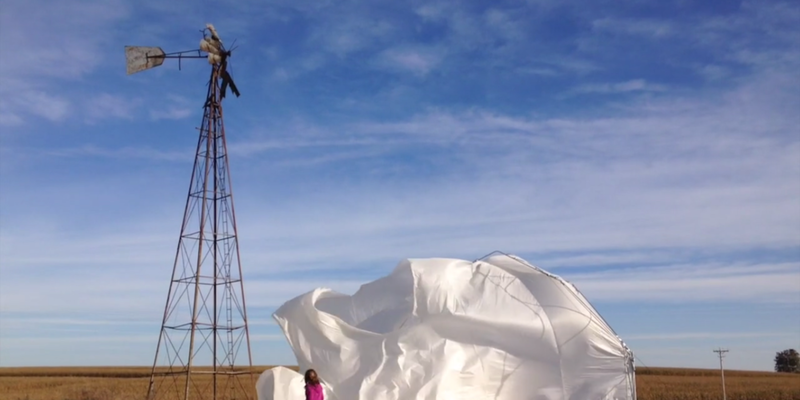 But I threw together a short video of three of the most striking: Brenda Baker's color-continuum laundry line, Peter Krsko's pile of tree limbs-turned geodesic dome, and Sarah West and Christopher Field's eerie yet charming "Ghost Barn."